Is Bill de Blasio about to take New York City's public safety back to the bad old days of rampant street crime and murder - or is he, like President Obama, mostly just slapping a new coat of rhetorical paint over largely unchanged security policies? The jury is still out, especially on the impact of a federal court decree that could yet hamstring the NYPD. But early indications suggest that de Blasio's Police Commissioner, William Bratton, is determined to keep in place the core of the "stop and frisk" policies that de Blasio campaigned against - policies whose foremost national advocate is none other than Bratton himself. Mayor de Blasio's fans and critics alike may have to grapple with the possibility that a lot less is going to change than his racially charged anti-law-enforcement campaign would suggest. Back in the pre-Giuliani days when muggings were a constant daily threat throughout New York City, they used to say that a conservative was just a liberal who had been mugged, and the City's political history bears that out. After enduring three decades of rising rates of street crime and violence, New Yorkers finally rebelled in 1993, booting David Dinkins from office in favor of Rudy Giuliani, the most conservative mayor of the City in modern times. 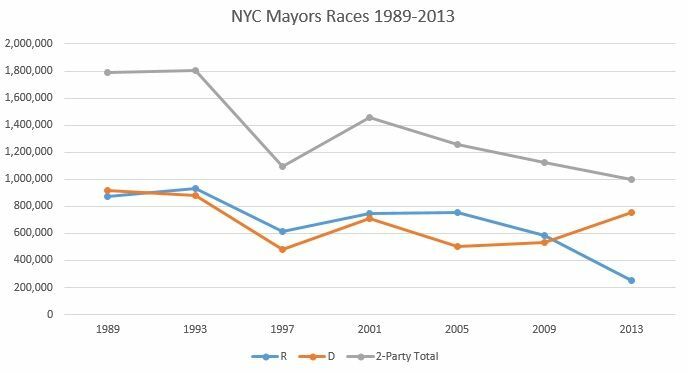 That political reality can't be lost on de Blasio: while national Democrats like Obama may fairly claim to have brought new voters into the process, de Blasio won on a tide of indifference and low turnout, and even in a city where Democrats have an 8-1 registration advantage (likely to grow after the devastation visited on Staten Island by 2012's Hurricane Sandy), he needs to keep the sleeping giant of single-issue anti-crime voters (many of whom are fairly liberal on other issues) from reawakening. For the moment, it's held at bay by amnesia and complacency. Most of today's progressives - most of New York's voters, in fact - don't remember the Dinkins years. Besides the 11% of voters under 30 in the 2013 election, there's the fact that roughly a million of the city's three million immigrants arrived since 2000, meaning that around 10% of New Yorkers only came to the United States since Mike Bloomberg became the Mayor. 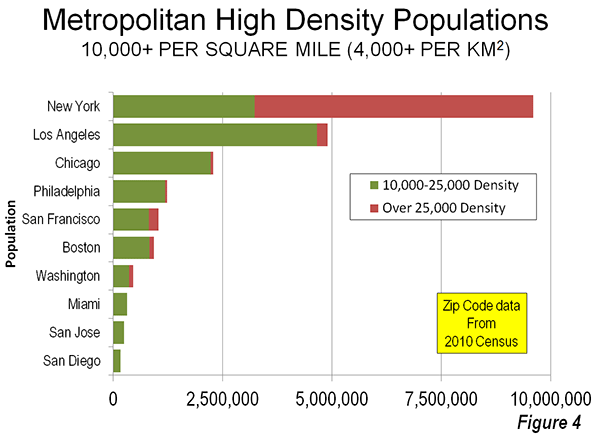 With that level of population turnover, New York lacks the collective memory to be alarmed, yet, by de Blasio's rhetoric. But results are another matter. It's hard to argue with the results that the Giuliani and Bloomberg Administrations achieved in New York, although a few die-hard Dinkins partisans - chief among them de Blasio, a former Dinkins aide married to another former Dinkins aide - argue that some of the credit should go to Dinkins himself for beginning the process of expanding the NYPD's street presence. Giuliani's first Police Commissioner had actually served under Dinkins: Bratton had been Dinkins' head of the Transit Police before moving to Boston to become Police Commissioner. And Dinkins' own Police Commissioner, Lee Brown, had already begun implementing new ideas about "community policing" that required a more aggressive presence on the streets of high-crime neighborhoods, ideas that were expanded when Dinkins replaced Brown in 1992 with Ray Kelly (the same Ray Kelly who was the target of many of de Blasio's barbs in his more recent tenure heading the NYPD). The idea that more patrolmen would have more interactions with the populace was already taking hold even before Rudy took office. In 1994, Rudy brought back Bratton, naming him as Kelly's successor to run the NYPD. Giuliani and Bratton brought the critical elements to the table that the Dinkins-Brown and even Dinkins-Kelly teams had lacked. The NYPD, from Bratton down to the ordinary beat cop, knew the Mayor was on their side even when they came under criticism - a major morale booster that had been lacking under the weak, ineffectual Dinkins, whose first instinct was always to pander to the Al Sharptons of the New York street. The new team brought an intense, demanding focus to restoring order (Brown, by contrast, had been nicknamed "Out of Town Brown" by the cops and the tabloids). They marshalled increasingly detailed data: the CompStat system, first developed by the Transit Police under Bratton, was rolled out city-wide, enabling the NYPD to track crime on a more detailed, weekly precinct-by-precinct and neighborhood-by-neighborhood basis and hold precinct commanders accountable for results. They put a social-science theory into practice as well: the NYPD went after low-level "lifestyle" street offenders like squeegee men, building on James Q. Wilson and George Kelling's "broken windows" theory of how social disorder encourages crime. And at the core of this process, where the rubber met the road, was the day-to-day activity of cops patrolling dangerous, crime-ridden neighborhoods and taking a proactive approach to threats by stopping and frisking people who looked suspicious - never an error-free process but one that resulted in scores of arrests of criminals carrying illegal guns and drugs. In a real sense, Bratton earned the title of "the father of stop and frisk," which he also later expanded in his tenure heading the LAPD from 2002-09. During the 1990s, crime rates in New York City dropped dramatically, even more than in the United States as a whole. Violent crime declined by more than 56 percent in the City, compared to about 28 percent in the nation as whole. Property crimes tumbled by about 65 percent, but fell only 26 percent nationally....Over the 1990s, misdemeanor arrests increased 70 percent in New York City. When arrests for misdemeanors had risen by 10 percent, indicating increased use of the "broken windows" method, robberies dropped 2.5 to 3.2 percent, and motor vehicle theft declined by 1.6 to 2.1 percent. Rudy was a revolutionary change-agent figure in New York, with a revolutionary personality; his abrasive, hard-charging style was a necessary element of his success, but it made him many enemies, and the magnitude of his success made him eager to claim the credit. And that led him into inevitable personality conflict with Bratton, himself an outsize personality who wanted his share of the limelight. Bratton left office abruptly in March 1996 after Giuliani ordered an investigation into a book deal Bratton had signed. Great success in fighting crime, but also controversies and the overshadowing tragedy of the September 11, 2001 terrorist attacks, would follow throughout Giuliani's remaining six years in office. It would take his departure from office to allow his successes to be institutionalized and separated from his personality. [N]ew all-time lows will be set in 2013 for the fewest homicides and fewest shootings in recorded city history. There have been 332 homicides so far this year, which is a reduction of 20 percent from the previous record low, which was established last year - and homicides have fallen nearly 50 percent since 2001. Similarly, the number of shootings have fallen by 20 percent from last year’s record low - with 1,093 shootings through Thursday, December 26th - down from 1,608 in 2001, a 32 percent reduction. Overall crime is now down 32 percent since 2001. ...[T]he NYPD is facing an unprecedented wave of 10,000 retirements in the next three years. These are cops hired 20 years ago under the "Safe Cities, Safe Streets" program, which was hastily ordered in 1992 by then-Mayor David Dinkins and the City Council to combat a tidal wave of crime that gripped the city. The tension between keeping a lid on the NYPD's budget and maintaining its aggressive presence on the streets was balanced by putting the heaviest burden of policing on the least expensive, least experienced members of the Force. Unless deeper cuts could be made to other parts of the City's enormous government, the new Mayor would have to decide if that balance should be reconsidered. Bratton is an ardent supporter of the policy because he says it's an effective means of reducing crime on the street. Last year, he even compared stop-and-frisk as a solution to crime to "chemotherapy" as a treatment for cancer. In an interview ...with NPR, Bratton hinted that the policy would be an effective crime-fighting tool in Oakland. "First off, stop-question-and-frisk has been around forever," he told me. "It is known by stop-and-frisk in New York, but other cities describe it other ways, like stop-question-and-frisk or Terry stops. It's based on a Supreme Court case from 1968, Terry v. Ohio, which focussed very significantly on it. Stop-and-frisk is such a basic tool of policing. It's one of the most fundamental practices in American policing. If cops are not doing stop-and-frisk, they are not doing their jobs. It is a basic, fundamental tool of police work in the whole country. If you do away with stop-and-frisk, this city will go down the chute as fast as anything you can imagine." We also discussed the current controversy over stop-and-frisk under Raymond Kelly, Bloomberg’s Police Commissioner. "What you have right now is a controversy in which nobody really understands what they are fighting about," Bratton said. "Stop-and-frisk is not a tool solely to look for guns. Unfortunately, both the Mayor and the Police Commissioner refer to it that way, and that’s a problem because so few guns are recovered. But so what? The vast majority of stops are for a wide variety of things. Is someone drinking a can of beer on the corner? You want to stop that behavior. If somebody is aggressively panhandling on the street, urinating against a building. Is there somebody that you suspect is casing a building? Or is that two guys just locked out of their apartment? Police officers notice what may be a burglary. Of course they should be noticing and investigating. There are countless examples of what you want police to do." The LAPD's improved image coincided...with a 49% spike in stops of pedestrians and motorists from 2002 to 2008, according to a Harvard Kennedy School report. Blacks comprised 9% of the city's population but accounted for 23% of all those stopped. Over the same period the number of stops which led to arrests doubled from 15% to 30%, suggesting the police tended to have good reason. "He co-opted us, and he co-opted us into the mission of … the cultural transformation of LAPD," she told the Los Angeles Times. Bratton also recruited many more Hispanic police officers. One result of Bratton's diplomatic outreach was that, at the end of his tenure in 2009, a federal court lifted a consent decree imposed in 2001. There are various theories as to why de Blasio would bring back a Police Commissioner from the Giuliani era with such a long track record of promoting the very thing de Blasio claimed to oppose. One is that de Blasio was pressured into the pick by New York's wealthy, liberal Democratic power brokers and bankrollers, who remain more important to his party than outraged leftists who regarded the appointment as a sellout - indeed, de Blasio just appointed a new head of the City Planning Commission whose experience is in gentrifying and Disneyfying Times Square, hardly a Left-populist move. Another is that he was more or less mugged by reality - once he knew he would be held responsible for keeping the City safe, he was forced (like Obama) to stop posturing and grow up. A third possibility is that de Blasio's Dinkins partisanship is asserting itself, intent on showing that Bratton, not Rudy, should be given the credit for the City's turnaround. Finally, there's the possibility that de Blasio - an admirer of Daniel Ortega who honeymooned in Castro's Cuba and voted to honor Robert Mugabe - isn't really any sort of civil libertarian at heart, and wants a strong police force to carry out the sort of expanded government powers he craves. Stop and Frisk is Dead...Long Live Stop and Frisk? "Operation impact is not going away. I would hope to potentially expand it using seasoned officers," Mr. Bratton said during a news conference at police headquarters. "The concern I have right now is that you have 10 or 12 of them assigned to one supervisor. I want to give these kids a much better training opportunity." He said instead of going after the "general population," his cops will go after the "known criminal population" of a community. "In Los Angeles, we had a database of 40,000 known gang members," he says. "We focused on them rather than good kids on the way home from school or work. We stop, questioned and frisked and often arrested those career criminals." The Patrolmen's Benevolent Association president, Patrick Lynch, released a statement saying the move is "consistent with the union's philosophy of training" and that "Using rookies to meet numbered targets under the former system resulted in many of the problems we are now in the process of solving." This leaves the question of where - given his many other ambitions for New York City government and the many demands he will face from the teachers and other public employee unions - de Blasio will get the money to pay for this. It also leaves unanswered whether de Blasio's supporters, who believed he was striking a decisive blow against what they regarded as a racist system, will be satisfied four years from now that law enforcement in the City has changed in a way they consider meaningful. That's the optimistic scenario - well, optimistic if you want the NYPD to keep its focus on improving its winning law enforcement formula rather than scrapping it for purposes of political pandering. But if the arrival of Bratton and his plans to preserve the core of stop-and-frisk and Operation Impact represent continuity, there are still ways in which the City's hard-won progress could be placed at risk by the new Mayor. The least of the opinion’s problems is the unnecessary bureaucracy it inflicts on the NYPD, including a federal monitor, burdensome reporting requirements, and left-wing advisory panels, all overseen by the plaintiffs’ attorneys. The most serious problem is [the district court's] statistical test of racial profiling, which compares police stops to population data, rather than crime data. The real risk to law enforcement is thus not that Bratton's NYPD will turn its back on stop-and-frisk, but that it will suffer death by a thousand cuts from intrusive oversight boards and loss of morale among patrol cops. The Daily News notes that "City cops stopped little more than 3,000 people in January, a far cry from the 50,000-people monthly tallies that were once commonplace under Kelly’s leadership" - a significant falloff, albeit one that is no doubt partly attributable to emptier streets in the bitter weather of the past month. And the biggest imponderable of all in morale is the new Mayor himself: one only need wait for the next controversy (in a city where 34,000 cops patrol 8.3 million people, a lot can happen and it usually does) to see whether he sends the cops the expected signal that City Hall doesn't have their back in a pinch. 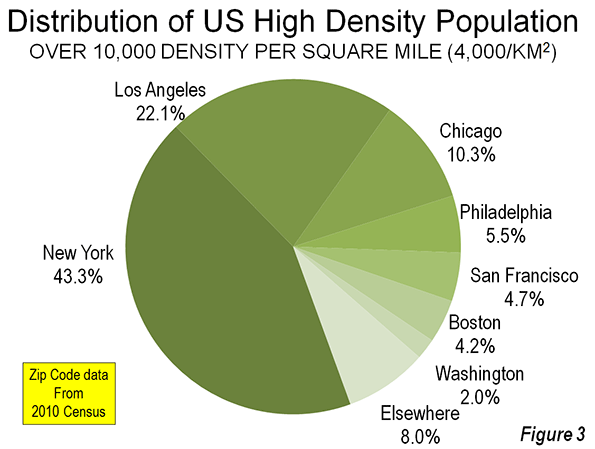 The advantage of high density is that it allows economies of scale in policing - New York not only has twice as many police per resident as Los Angeles, it can concentrate them in much smaller areas, making it a lot harder to hide from the cops. This is, in fact, the argument for why New Yorkers don't need to own guns: there are already lots of guns on the street everywhere you turn, in the hands of officers of the law. With a large, densely concentrated police force on hand, New York has gone further down the road than anywhere else in the country in accepting the security state in exchange for keeping violence at bay. Mayor de Blasio's decision to bring back William Bratton and retain the core of stop-and-frisk suggests that it will be harder than de Blasio's supporters think to unsettle that bargain. But the proof of whether they can undermine it indirectly from the shadows of bureaucracy, and whether that costs the City its hard-won gains, will be told in the CompStat reports and body counts of the next four years. NYC: More cops than any other big city. USA: More imprisoned citizens than any country in the history of mankind. Yet the bankers, who crashed the world's economy through fraud, still aren't charged, convicted, or imprisoned. Crank, can I get you to admit the obvious? : we live in a two-tier justice system. If so, 'm sure you can use that vivid imagination of yours to lay the blame at the feet of Obama and the Democrats (while white-washing any actions by conservatives or the GOP, that have made it so).